Same style of shorts, down three pant sizes. The prevalence of individuals who are overweight and/or obese is skyrocketing, and the number of people who are seeking advice on how to lose fat is rapidly growing. In a randomized survey of about 65,000 adults conducted by Gallup, it was projected that in the U.S., the adult obesity rate is at 27.7% as of May 2014. This means that for every 1 in 4 adults you meet in the U.S., you can expect to encounter an individual who is obese, which is an alarming ratio. With the increase in the number of individuals who are overweight or obese, heart disease, hypertension, diabetes, and a whole host of other diseases and illnesses are impacting the lives of our friends, family members, and peers. The health and fitness industry is taking advantage of this time and flooding mass media with tips, tricks, and shortcuts on how to lose weight. Fitness publications are touting the latest and greatest weight-loss products and promoting fad diets as an attempt to generate profits off of people who may be ill-informed and those who seek that one magic pill. I am not offering a magic weight loss pill or encouraging any type of shortcut to losing fat. 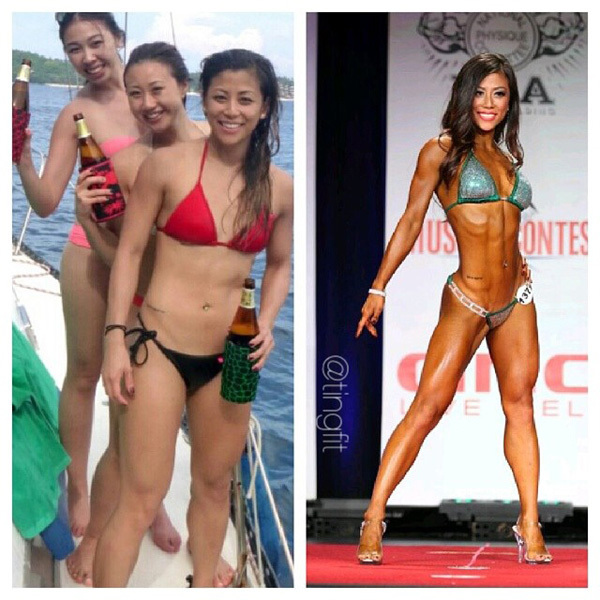 What I do promote, however, is a healthy and sustainable approach to losing body fat. I want to share with you the knowledge I’ve gained from countless discussions with personal trainers and bodybuilders, lots of research, and numerous personal experiments I’ve conducted on myself and others. I want you to have the body of your dreams. I want to supply the information you may be looking for to live healthier and longer, without functional limitations due to weight. I hate to burst your bubble, but I’m here to tell you that crash diets are ineffective for sustained weight loss and the magical one-size-fits-all pills do not exist. So let’s cut the fluff and get straight to the tried and true method of reducing body fat. I am going to give it to you hard and fast. 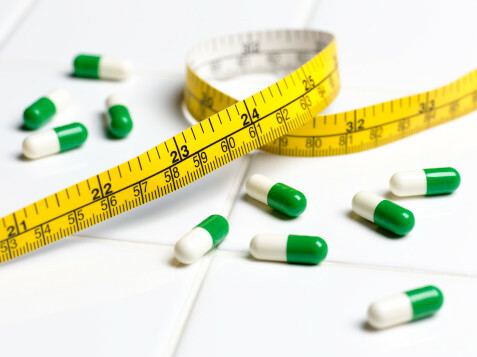 There is no shortcut to cutting weight, and there aren’t any miracle pills that will instantaneously melt fat off of your body in a short period of time. There are supplements that can certainly aid in fat loss, but the only method that works effectively surrounds metabolism. If you follow the method that is outlined in this post 100%, you will lose weight. Unless you’ve been restricting calories for an extended period of time (which I will post about later), have hormonal imbalances, medical issues, or issues with your gut microbiome, I am confident that the formula here will reduce your body fat. 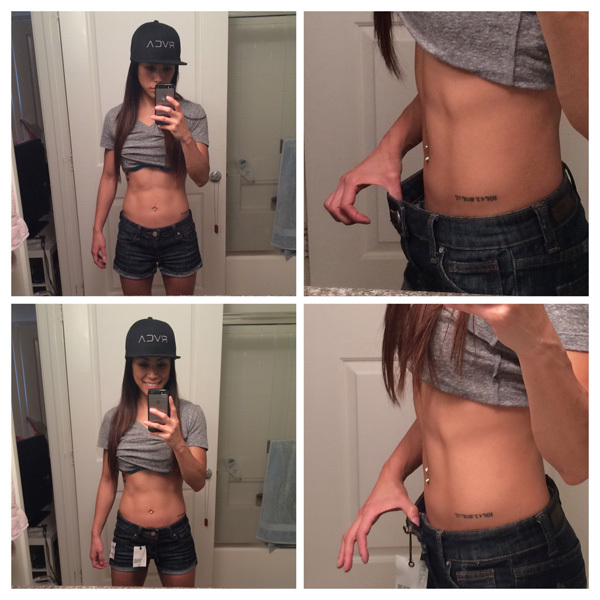 If you follow this method strictly and still struggle with fat-loss, then there may be hormonal and inflammatory issues that should be dealt with first. This is part 1 of a 3-post series. If you want to lose fat and maintain muscle mass more effectively (part 2 of 3), then the link provided outlines the fundamental concepts you need to understand in conjunction with the information that follows. If you want to get your fat loss even more dialed in, then check out How to Calculate Macros to Lose Fat and Maintain Muscle for additional details (part 3 of 3). Before delving into the method for fat-loss, we’ll first touch on the fundamentals of energy metabolism. Metabolism is a complex, physiological process that takes place in the human body. In short, it converts the foods and beverages you consume into energy. The energy that is supplied from the food you eat allows for normal cell function. Your body requires this energy to sustain life, helping to circulate the blood in your body, keep your heart beating, regulate breathing, grow and repair tissue, regulate hormone activity, and much more. Think of your metabolic system as your life support. A Calorie, otherwise known as a kilocalorie (often used interchangeably with a lowercased “calorie”, which actually means something else), is the approximate amount of energy needed to raise the temperature of one kilogram of water one degree Celsius. Calories are often associated with food, but in actuality, they apply to anything that contains energy. Take an apple for example – A medium-sized apple about 3 inches in diameter contains roughly 90 calories. This essentially means that the apple contains 90 calories of energy that your body can use to kick off any number of biochemical processes. For the rest of this blog post, I will use the lowercase calorie to mean a kilocalorie. As cars require fuel to operate, the human body requires calories to function. 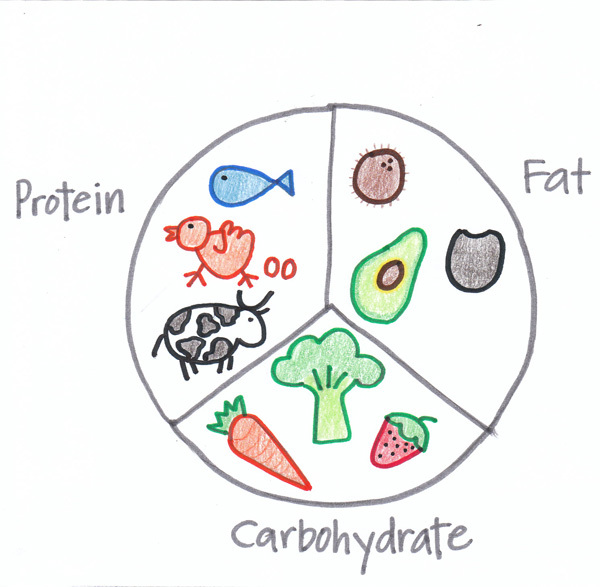 Macronutrients: Carbs, Fat, and Protein. So if a food contains 10g of carbohydrates, 10g of protein, and 10g of fat, that food contains and provides the energy equivalent to 170 calories. What Are the Basal Metabolic Rate (BMR) and Total Daily Energy Expenditure (TDEE)? The Basal Metabolic Rate (BMR) is the energy expenditure or calories burned in a 24-hour period for an individual at rest. The BMR excludes any and all physical activity. The BMR is basically what your body needs to just stay alive (breathing, pumping blood, etc.). As an example, I am currently 28 years old, 4’11”, and weigh 103 pounds.Using the Harris-Benedict equation, my BMR should be around 1,250 calories per day. So if I were to lay in bed, motionless for 24 hours, this is how much energy is required for me to sustain life. While I prefer to use the Katch-Mcardle formula because it takes into consideration body composition (the amount of relative fat to fat-free mass in your body), I chose to go with the Harris-Benedict BMR calculator here since most people are unaware of their body fat percentage. The Katch-Mcardle formula will improve accuracy when body composition leans toward the ends of the spectrum of body fat percentage (very muscular or obese). In order to estimate how many calories your body needs per day, you must incorporate an estimate of the energy you require through the physical activity you engage in on an average day. When you combine your BMR and adjust for physical activity, you will arrive at your Total Daily Energy Expenditure (TDEE). The thermic effect of food (the amount of energy your body uses to digest food) plays a role in the amount of calories burned per day as well, but to simplify our calculations later, I won’t be including this. What Role Does Metabolism, BMR, and TDEE Play in to Lose Fat? There are two primary channels in which your body taps into for energy. Your body can either generate energy from the foods that you eat or extracts from its energy stores, typically stored in fat or muscles. After every meal, food is broken down into molecules that can be immediately used for energy by the body. If your body burns all the energy from the meal you just ate, it will then tap into fat and muscle stores for added energy. However, if you don’t burn all that free-flowing energy after eating, much of the remainder is then stored as fat. This balancing act of energy intake to energy expenditure is known as energy balance. When you consume more calories or energy than you expend in a day, you have essentially inherited an excess amount of energy or created a “calorie surplus.” When you consume fewer calories than what you use up in a day, then you’ve created a negative energy balance or “calorie deficit.” The latter is the situation you need to be in to lose fat. You probably know where I’m going with this. Losing weight only requires some basic math skills. To lose fat, it really does not matter what you eat, but how much you eat. This doesn’t mean that I’d recommend eating burgers and fries every day because micronutrients play a critical role in the success of body re-composition and improving overall health. But, if you’re looking to lose fat and bring your body fat percentage down, it really comes down to regulating the amount of energy you are supplying to your body and the amount you are expending if you are without medical, hormonal, and gut issues. In the end, it’s not the carbs, fat, or protein that is making you fat; it is overeating that is the culprit. It isn’t the slow metabolism that many claim they have either – note that a small percentage of the population really is affected by a dysfunctional thyroid, which impacts metabolism, but most of us are in the clear. Ultimately, if you want to lose fat, you need to eat less and move more. Regardless the macronutrient profile, if you are creating a caloric deficit, you will lose fat. It’s as simple as that and is demonstrated in this study of 811 overweight adults over a two year period: Comparison of Weight-Loss Diets With Different Compositions of Fat, Protein, and Carbohydrates. In another study: Comparison of the Atkins, Ornish, Weight Watchers, and Zone Diets for Weight Loss and Heart Disease Risk Reduction, there were no statistical differences in weight loss by diet program. Now, let’s get to the good stuff! Losing weight requires very basic math skills. Again, this is part 1 of a 3-part series. After getting a full understanding of part 1 first, then move on to part 2 with How to Lose Fat and Maintain Muscle Mass. Then I’d suggest following along to part 3 with How to Calculate Macros to Lose Fat and Maintain Muscle Mass. Follow the instructions below, and you’ll be well on your way to losing fat and getting the body you’ve always wanted. If you know your body fat percentage, use the Katch-Mcardle BMR calculator. If you do not know your body fat percentage, use the Harris-Benedict BMR calculator. Example: I am female, age 28, 4’11”, and weight 103 pounds. Using the Harris-Benedict calculator, my BMR is roughly 1,250 calories per day on average. Note 1: I’ve modified the standard factors used to adjust for physical activity levels. In my personal experience, I’ve found that the traditional multipliers are too high for current, common lifestyles. Note 2: Chatting with friends, hanging out by the water fountain, and resting for more than five minutes should not count as contributing to total hours of exercise. Example: I typically average about 10 hours per week in exercise. Since this is well over six hours per week, I can be categorized in the “Moderate to High Activity Level” group, so my factor is 1.55. Multiply your BMR from Step 1 and physical activity level factor from Step 2 to arrive at your TDEE. Example: My BMR is 1,250 calories per day and my multiplying factor is 1.55. Multiplying these two numbers gives me a TDEE of 1,940 calories per day. This is the amount of calories I need to sustain life and the physical activities I perform each day. In order to lose weight, you need to be in a negative energy balance or eat at a caloric deficit. This means you are consuming less energy than your body is using each day. In a caloric deficit, your body will begin to tap into its fat stores for energy through the mechanisms of energy balance. Multiply your TDEE by 75-80%, which is a 20-25% reduction in calories per day. I recommend beginning with 80% and adjusting as necessary depending on how you feel and your rate of progress. If you hit your numbers every day, you should be losing 1-2 pounds per week, depending on caloric intake. 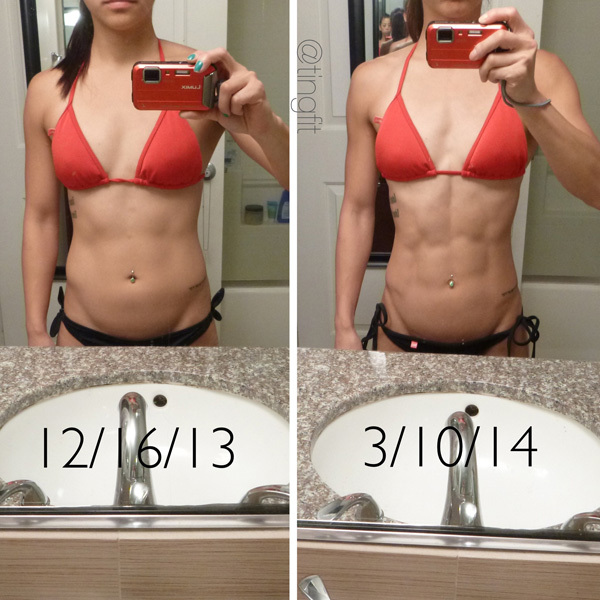 If you’re lean already, fat loss rates may looks more like 0.5-1 pound per week. If you’re overweight, weekly fat loss could be 2 pounds or more. When I’m cutting weight, I aim for no more than one pound per week. Any more than that indicates that I am eating too little or exercising too much.. or potentially both. Shedding fat too quickly puts you at risk for losing muscle mass, which is not desirable. Muscle mass is what gives you that sculpted and “toned” look, so you definitely don’t want to be losing that. Now that you’ve calculated what your calorie intake should be to lose fat, you’ll want to create a meal plan that fits your calorie target. It’s important to create a meal plan that you’ll enjoy. 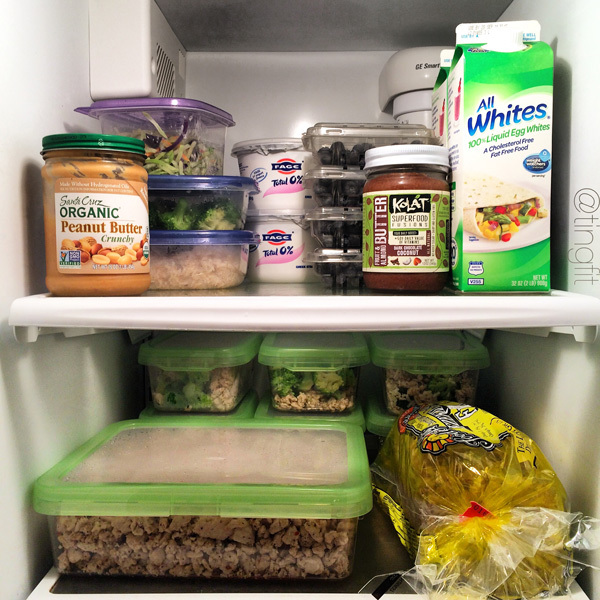 The more enjoyable a meal plan is, the more sustainable it will be. To make things easy, you can plan for a whole day’s worth of meals and eat that every day, which is what I do for weeks at a time. If you’re the type of person who needs variety, create a meal plan for each day of the week, and repeat weekly, so you don’t get bored with your food. Example: This is a sample of what a ~1,450 calories per day meal plan may look like, and what I ate for about a week recently. It’s important to note that I regularly experiment with macros and ensure there’s a variety of foods I’m eating. What is shown below is likely different from what I’ll eat in another two weeks. Sometimes there will be a bigger emphasis on vegetables, fattier foods (always prefer whole fat despite the photo below), or fermented foods for example. Note: You can break up your meals however you like. Eating according to what fits your schedule is best, as it will be easier to sustain. I personally enjoy eating smaller, more frequent meals throughout the day. In experimenting with three meals per day, I’ve found that I get too hungry between meals. This makes me more susceptible to snacking on something that isn’t in my meal plan, which hinders my progress. Thus, I prefer 4-5 meals per day, sometimes 6. Remember that there really isn’t a universal formula that works best for everyone. Effective weight loss and alterations to body composition require attention to detail, tracking, patience, and the discipline to keep at it. It’s critical to be in tune with how you feel and how your physique is changing. Measuring and tracking your progress is key to knowing what types of adjustments you should be making to better suit your lifestyle and goals.